Srisailam Temple Room Accommodation Online Booking, Price, Phone: Srisailam is one of the most ancient kshetras in India. This temple is situated on the flat top of the Nallamala Hill. It is on the right side of the River Krishna in Kurnool district of Andhra Pradesh. It has been a salivate pilgrimage or centuries. The prominence of this divya kshetram is highlighted by the fact that while performing our daily household rituals we specify place of location of our existence with reference to srisailam. 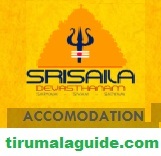 Srisailam Devasthanam administration has taken all measurements for the pilgrim’s comfortable stay on the srisailam. Visitors will be offered different kind of accommodation ranging from normal rooms to A.C suits in various choultries and guest houses in srisailam. For the convenience of the casual visitors devasthanam provides locker facility to keep their languages. Advance reservation facility is provided for all the accommodation 20% only in all accommodations except V.V.I.P cottages. Remaining accommodation and cottages are given at central reservation office at Ganga sadan. The check in and checkout timings of online booking accommodation is 8:00 A.M to 8:00 A.M. the advance amount should be deposited at the central reservation office reception counter and the advance amount will be refunded at the time of checkout. In this we provide you the information about the procedure to book the accommodation in srisailam through online. The below is the Srisailam Temple Accommodation Online Booking Procedure. The below is the procedure to book the accommodation through online. Open the official website of the srisailam devasthanam. srisaiamonline.com. Then the srisailam Online home page will be displayed in that choose online booking option. After that it will directs you to another page, in which choose for accommodation option. Srisailam online accommodation booking page will be appear. In that enter the date on which you want to accommodate, choose the type of room and how many beds you want. After that it will show you the available cottages list according to your preference given above. Then choose the cottage as per your availability and enter all the details personal details. And pay the amount for the accommodation at the time of booking only. Once accommodation is booked the booked accommodation not transferable and it cannot be cancelled. Money will not refundable.